If you’re the type to bite off the top of an oyster cracker and, with surgical precision, inject a glob of hot sauce into that bad boy to create a “cracker bomb,” I hate to break it to you, but you’re a food-player. The good news for you is that Metropole is here to support your childlike tendencies—except, you know, with booze. 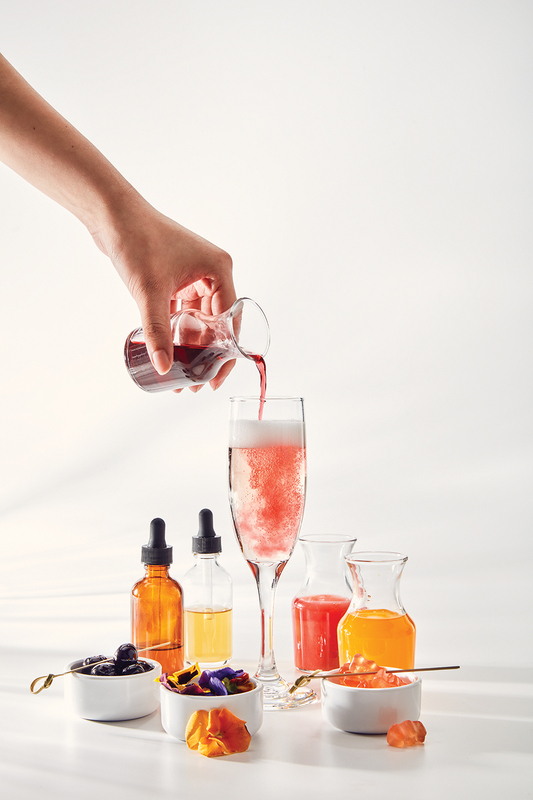 Enter the Mimosa Experience: a build-your-own concept that’s part fancy brunch, part children’s laboratory kit. A bottle of bubbly Prosecco serves as the base, and a selection of fruity elixirs in miniature carafes (just pretend they’re beakers) sweeten the deal, including orange juice, a house-made raspberry-vanilla shrub (which changes seasonally), and the one that will really make you feel like a mad scientist: a specially concocted “liquid mercury.” The lemon liqueur infused with edible luster dust—what pastry chefs paint onto sweets, giving them a shiny, metallic look—creates mesmerizing shimmery swirls. Top off your flute with amarena cherries or Prosecco-flavored gummy bears, and you’ll feel like a kid again before the avocado toast arrives.